US 90 at I-10 Truck U-Turn Facility, Baker County, FDOT District 2 - Faller Davis & Associates, Inc. 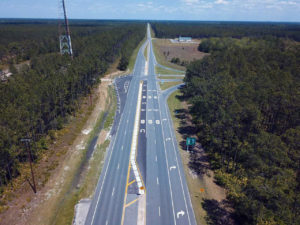 In order to mitigate several high speed fatal crashes due to the reduced sight distance at the SR 10 (US 90) at I-10 interchange, the FDOT plans to construct roundabouts at the ramp intersections. The left turn movement to provide westbound access to Olustee from the eastbound exit ramp was removed to reduce potential crashes. As an interim improvement, FDA designed a U-turn facility to accommodate the anticipated 3,000 daily vehicles that includes 30% truck traffic.